Har Gau (see recipe) and Siew Mai (or usually translated to Steamed Meat Dumpling) combine to form the one of the most popular pairing of dim sum dishes in Singapore. While Siew Mai is traditionally made with pork, this version uses chicken meat. This halal version steamed dumplings should work for everyone which you can certainly try out at home for breakfast or on the weekend and your kids will love it. Combine minced chicken with other ingredients in a large mixing bowl and seasonings and set aside in the fridge for 30 minutes. Put a piece of wantan skin on your palm. Put one tablespoon of filling on each wrapper, gather up the sides and leave the center open (Make sure the bottom is flat). 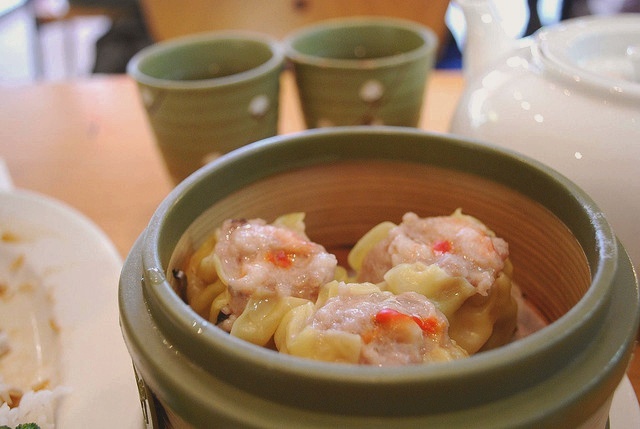 Arrange the siew mai in a bamboo steamer and garnish the top with some chopped carrot for color. Steam over high heat for 10 – 15 minutes. Serve Siew Mai hot with sweet sauce and chilli sauce. Look delicious, must try to do it one day.